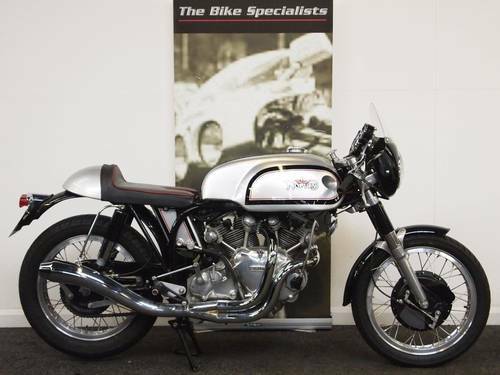 This new page will allow you to look at the history of sales and get a feel of what Vincent specials are sold for over the years. Please be aware that unlike for the stock Vincents where the market price is driven mainly by the history of the machine, the respect of the original specification, the rarity of the model, a fully professional restored condition, not to mention the famous “matching numbers” or the eventual unrestored bonus factors, for the Specials it is a very different dynamic which is even more complex. So watch out what you are buying and always ask assistance of a friend or an expert whose opinion will likely be more pragmatic and less passionate than yours! 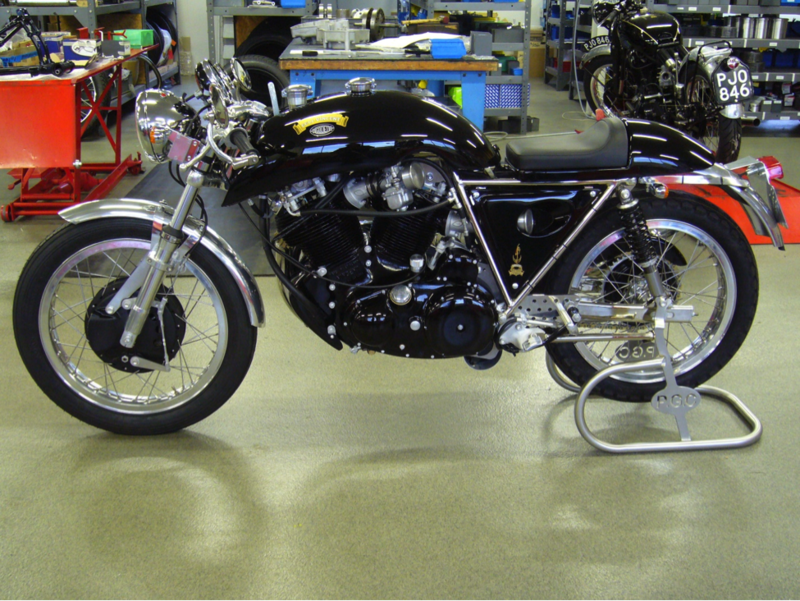 Know as Shadow 70 this machine was built with a Rapide engine of 1951 and comes with full history. It had never be ridden before the current owner who acquired it in 2011. 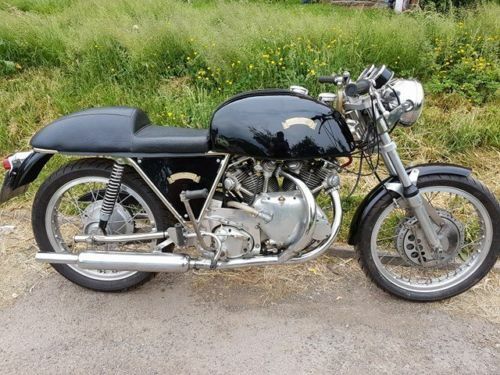 Built using a donor 1951 Vincent twin this bike retains its original numbers and is a genuine period machine and not a new build like most of the bikes out there at the moment and even has a buff log book in the history file. 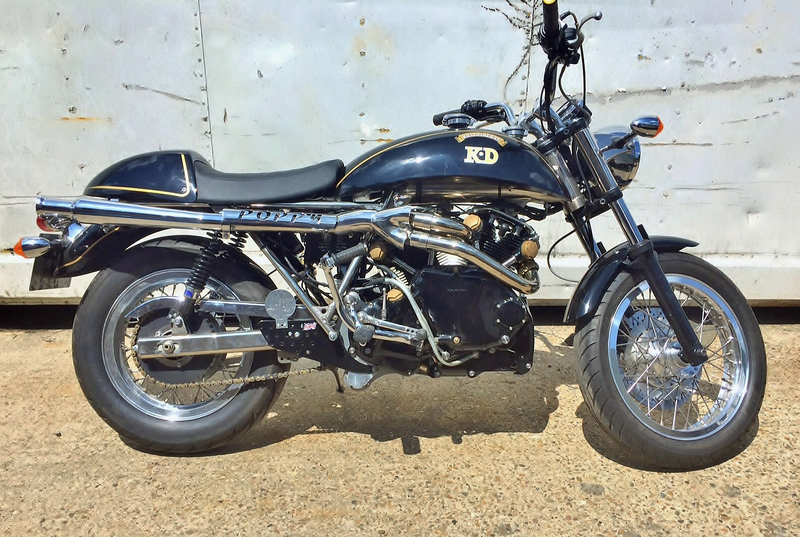 This bike also boasts a superb Bob Dunn built engine. The bike has been in our family since 2006 and we are only selling it to make space for a Classic car. Located in Leamington spa, Warwickshire. 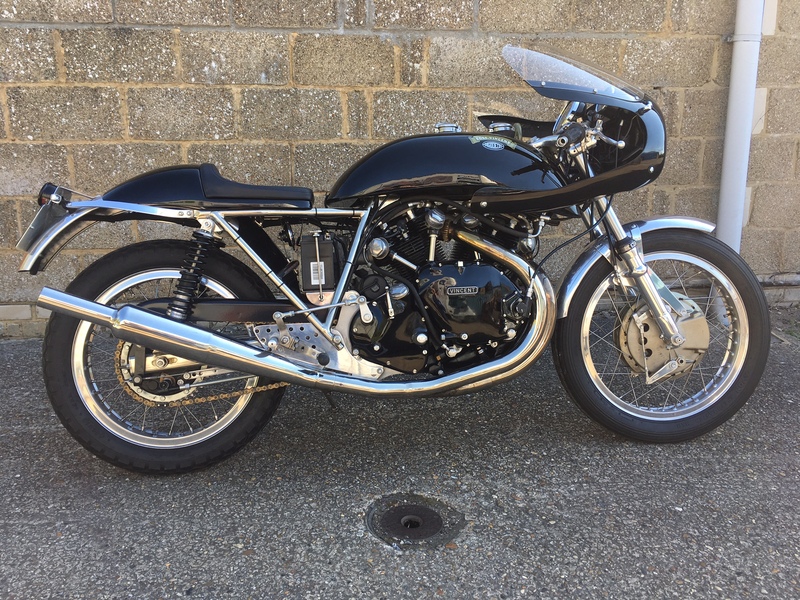 Was for sale in Australia a few months ago and now is in the UK, VIN41 was one of the very first machine built by Slater after he discontinued the supply relationship with Fritz Egli. The Godets continue to hold very well their value on the pre-owned market, selling generally fast and well. 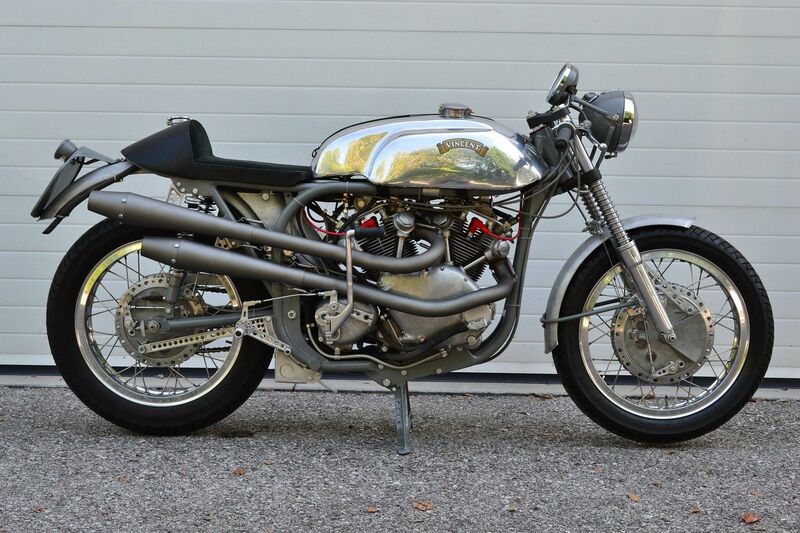 This Café Racer went for $107,250 at the last Mecum auction at Las Vegas. 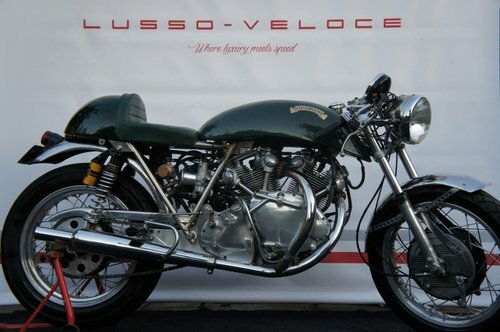 1968 1000cc Egli Vincent Café Racer. Immaculate condition. 5,000 miles. Costing Over £70,000 When Ordered. 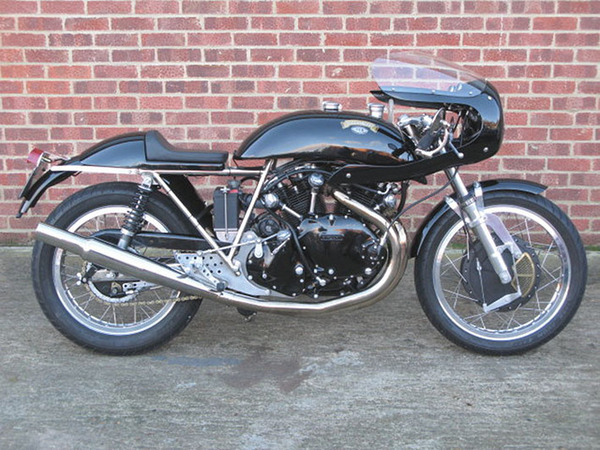 CTG-Vincent Egli style frame built by Colin Taylor. 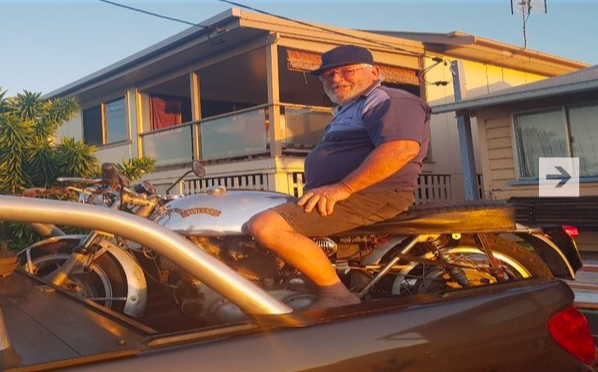 1300cc Bob Dunn engine tith Twin plug head, Carillo rods, J&E pistons, BTH magneto, Big bore Gardiner type race carbs 38mm, Flowed big valve heads, Flowed header exhaust system, Newby dry clutch and belt drive. 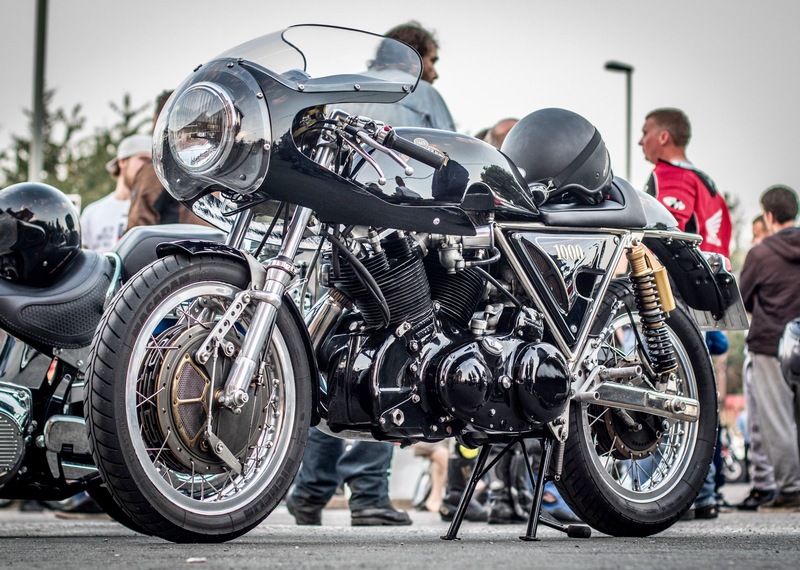 Built by Patrick Godet. 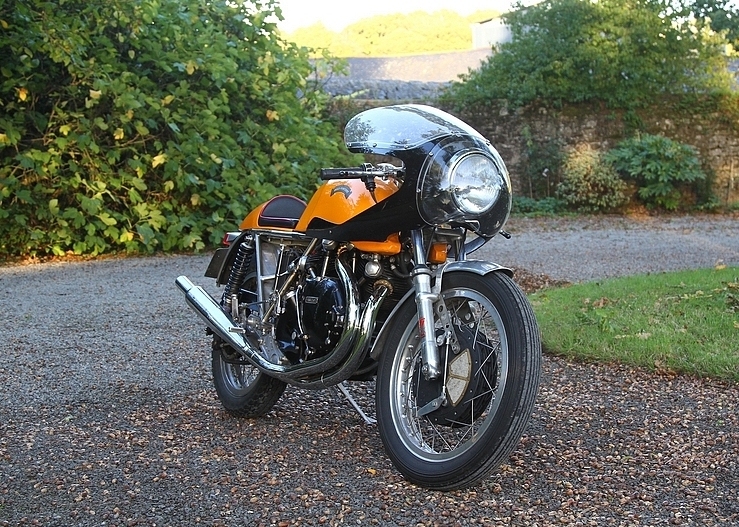 A stunning evocation of the original Egli. Electric start. Travelled less than 150mi from new. Sports configuration. Fontana front brake. Built in 1988 by Jack Barker for one of one of his friend. Engine has lightened flywheels, Mk2 camshaft, twin-plug cylinder head and 9:1 compression ratio. It is mated with a Norton gearbox. 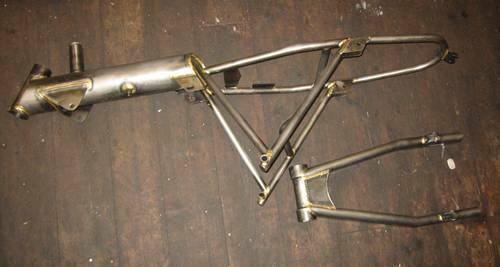 Frame built by MRD Metisse made of Reynolds 531 and was nickel plated. Marzocchi front fork with a 9in Grimeca 4LS front brake. Conical rear hub. 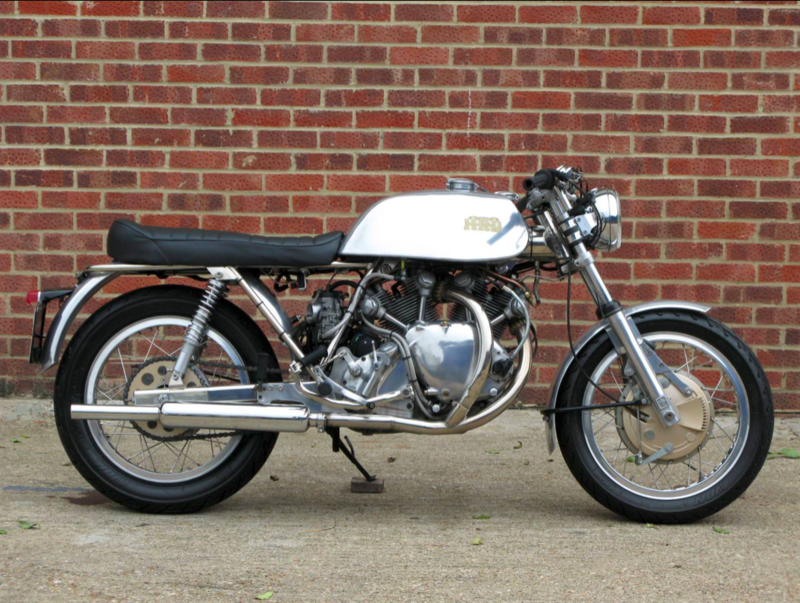 The title is a 1965 Norton (V5). Electronic Ignition and 12v Alton. Aluminum tank. Comment: unique build. You won’t see another one like that! 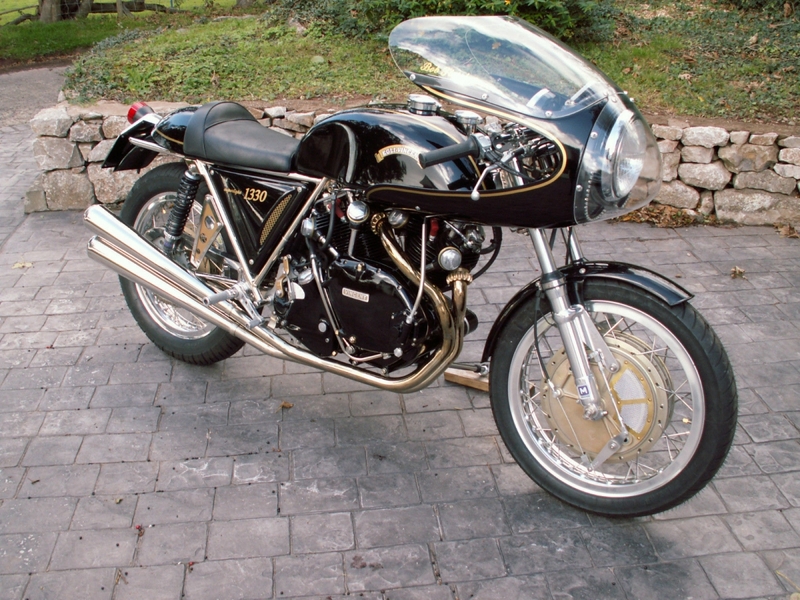 Vincent Engine Number: F10AB/2/10728 (Vincent Rapide D from 1955) and Norton frame number: 56228 (wideline frame from 1954). Engine was completely rebuild with new parts from Maughan & Sons, England and rebored to 90mm which gives the engine 1140ccm and some extra torque. The 90mm pistons were custom produced by Wahl, Germany and the engine comes with a double ignition. The wideline frame was adjusted to fit the engine and gives it a perfect low centre of gravity position. The chopped engine was extended with the market leading TT Industries 5-speed extra heavy duty gearbox from New Zealand and a Bob Newby primary beltdrive and clutch. Hand made alloy tanks were produced to fit perfectly between frame & engine, 2nd alloy tank sits in the back underneath the seat for easier refilling and checking of oil circulation. The breathing of the engine was taking care through extra pipes from the crank and the top of the cylinder heads. Specially built high level exhaust system by Alden Exhausts, England. 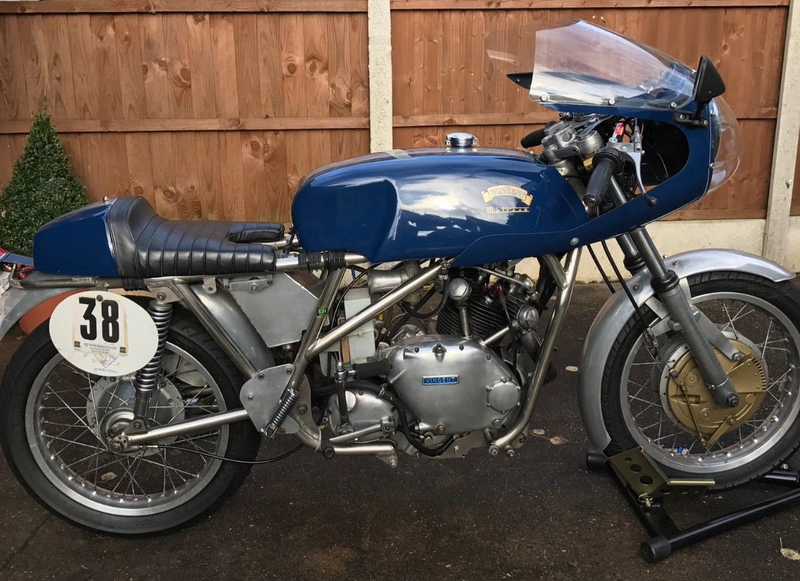 Complete rebuild; original cases but most everything else new – barrels, two front heads, transmission, V3 Multi Disc clutch, Carrillo rods, MK 11 Black Lightning racing cams, Amal T.T. 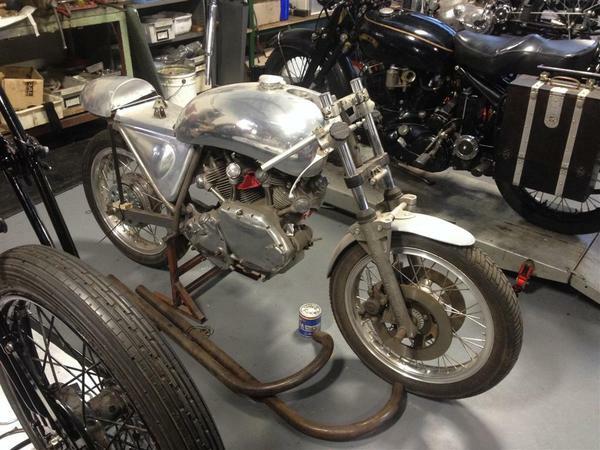 Carbs, B.T.H Magneto, electric starter, custom stainless exhaust pipes. Comment: rare D engine and pretty well put together. 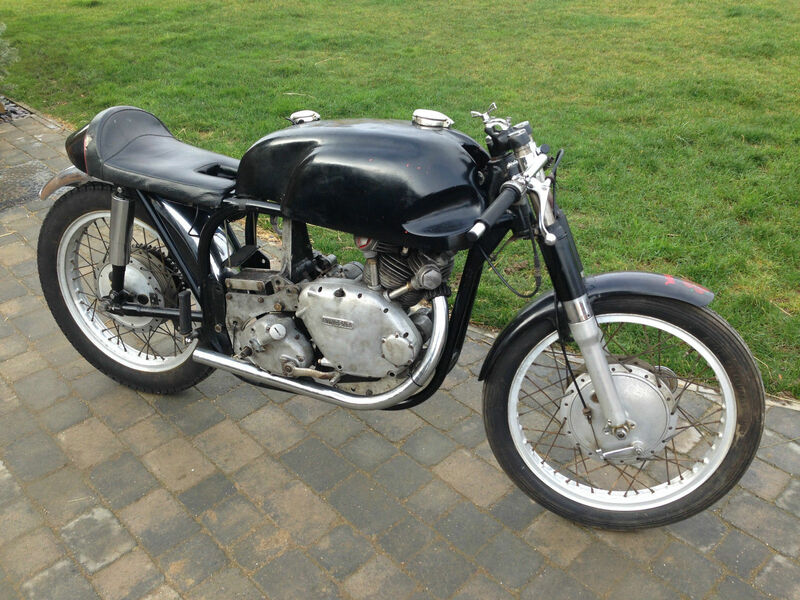 This bike has a 1949 Vincent Rapide engine (F10AB/1/2168) while the chassis is a Egli-Replica which seems to have been built by Andy Sidlow (RC/1/11576B which is a 1952 Comet frame VIN). This machine was built up in 1997. It comes with a file of invoices for parts that includes work to the engine at this time. The front forks and yokes are Paioli with a Grimeca type double sided twin leading shoe front brake and matching single rear drum, both wheels have Akront alloy rims. The engine still has 6v electrics and is running on Mikuni carbs. Currently showing 1,036 miles it comes with a small history file . Asking price is GBP 59,995. Frame RC/1A/5682 and engine F5AB/2B/3782 that match a bike that was delivered Sep 11, 1950 to the Vincent dealer in Brazil. 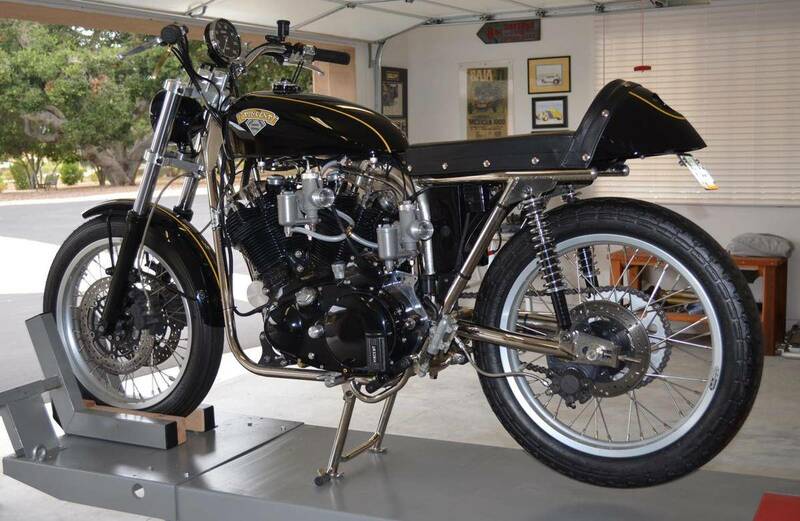 It is a 1200cc that was built by RTV in which Terry Prince and Rodney Brown were involved. Unfortunately the venture went bankrupt before the business could took off. 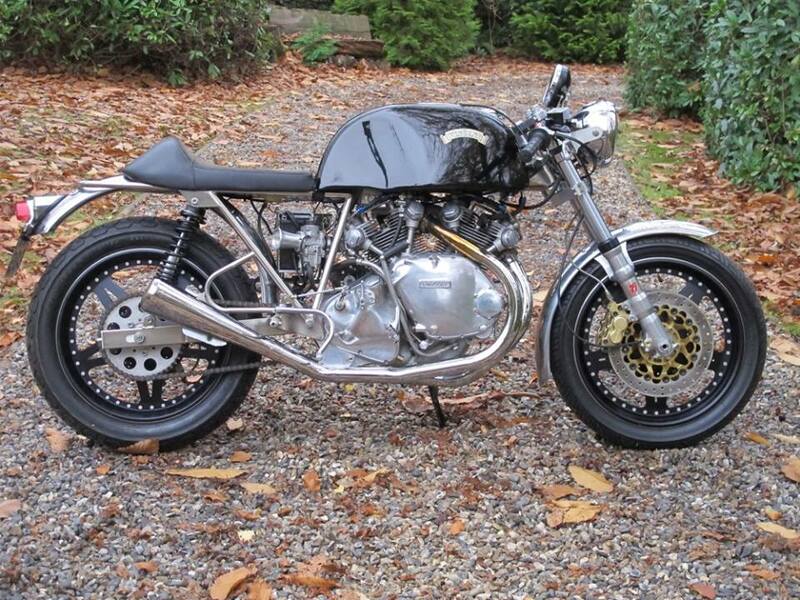 The bike is a 1000cc with Shadow specification is a multiple concours winner and based Nottingham UK. Interesting machine that got unsold, the Comet have never been as popular as the twin. This is a genuine Swiss Egli built in 1969 and one of the 4 that got a 30mm lower sitting a built by Fritz for his then wife Margrit. Seller has the original bill of sale and also letter confirming this was one of the 4 with frame number EV29D single from Fritz Egli . 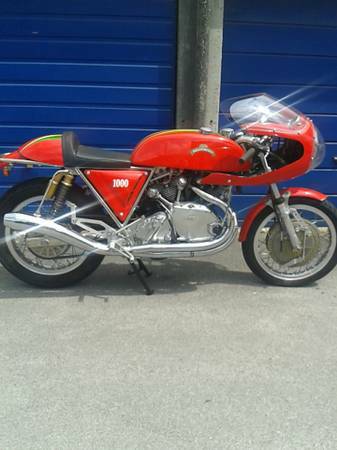 Comes with full history file fist owner Phil French who was the UK Egli section organizer. 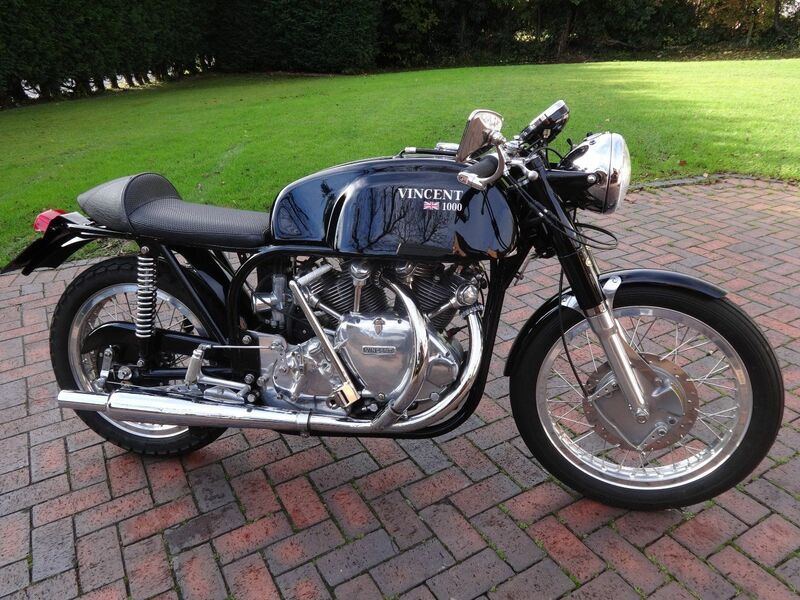 has had a full restoration engine has been built by Vincent specialists Maughan and sons with many new parts. 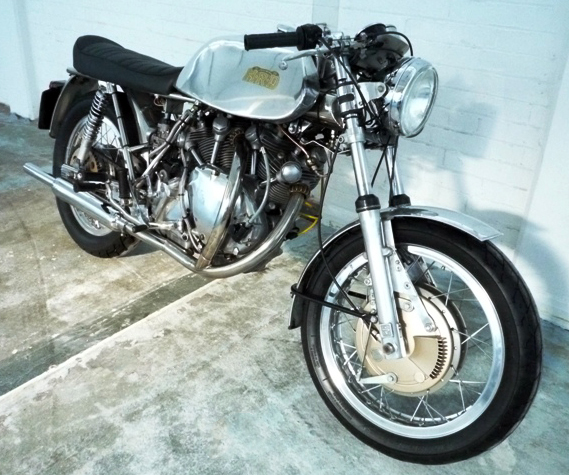 Original Lyta alloy tank , new alloy seat, original MP Racing forks with twin leading front brake , Vincent rear. Electronic mag , Alternator , Dunlop alloy rims. Contact: +44 (0)7881 913 478. 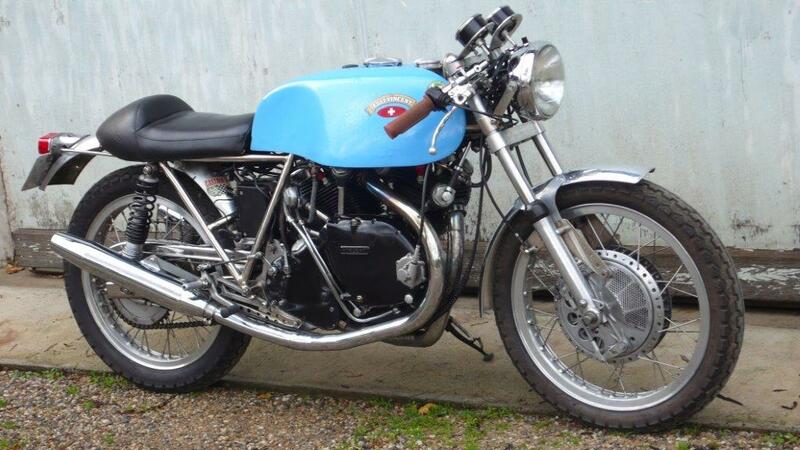 Asking price £26,000 Comment: unfortunately during the restoration process a rear loop has been bolted to the frame. Unfinished project. Rebuilt Series B Engine by Terry Prince 1/2660. Frame TPV30/B. Great opportunity to complete it your way. 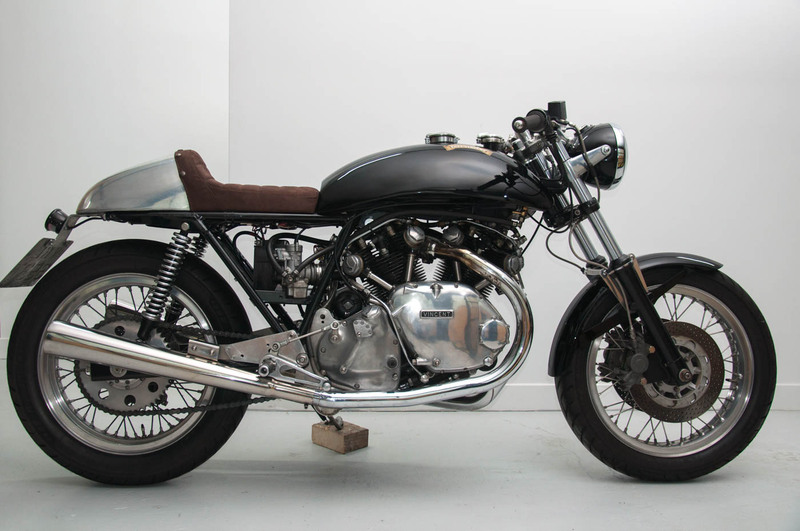 Alloy tank + seat professionally built. Ducati Suspension incl. Egli Racing front end. Brembo Discs, Lockheed brakes. Alloy wheels. 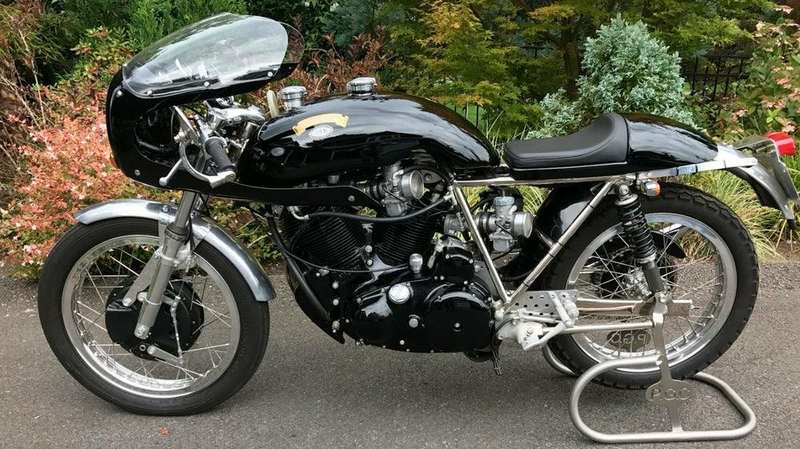 Built with original Vincent-HRD 1949 Rapide engine (F10AB/1/2168) and an Egli replica frame with unknown origine (maybe Slater or later replica) whose VIN is RC/1/11576B (original Black Shadow frame VIN). 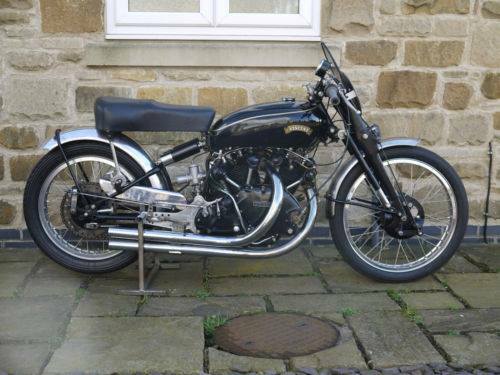 Seller says to have a Certificate of Authenticity from The Vincent HRD Owners Club. 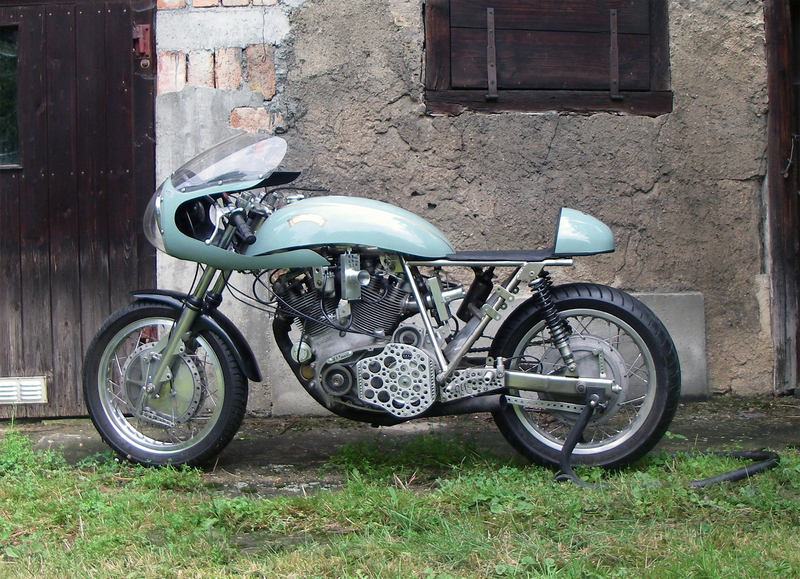 1330cc Superlight built by by Cottino Racing in 2009. Engine was commissioned from Bob Dunn with crankcases cast in Magnesium. 5-speed gearbox. 36mm Mikuni carbs. Frame from Andy Sidlow. Ceriani suspensions and upgraded by Maxton. Front and rear brakes from Fontana (Magnesium) laced into flanged alloy rims with stainless spokes. 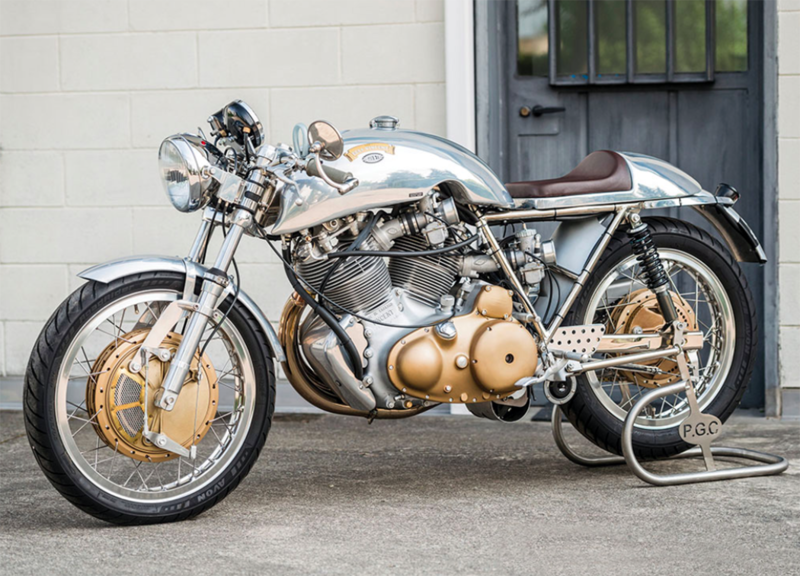 All the fittings on the bike are stainless or titanium. 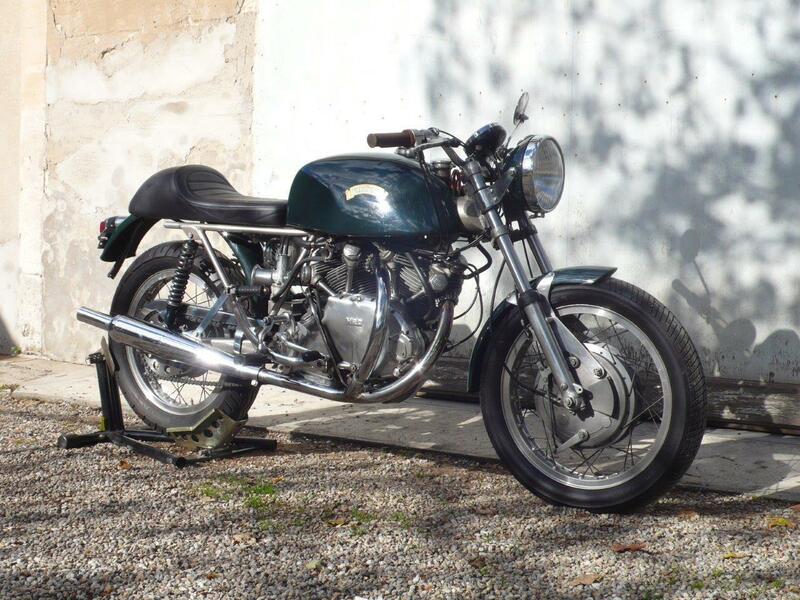 The bike is registered on its original 1950 paperwork which is now registered as a Egli Vincent. Comment: superbly build loaded with premium parts, however the 1950 paperwork does not match the frame period. Keep in mid this fact depending where you are going to title the bike (currently in the UK). Note that the asking price from £55,000 (04/2016) to £59,950 as of today. Known as “Lady Blue Note”. 998cc. 3888 miles. 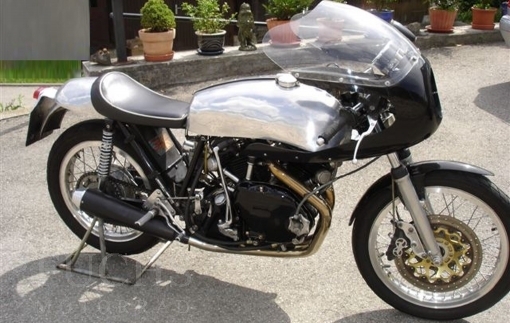 Manufactured by Patrick Godet and fitted with original Rapide engine to shadow specification. 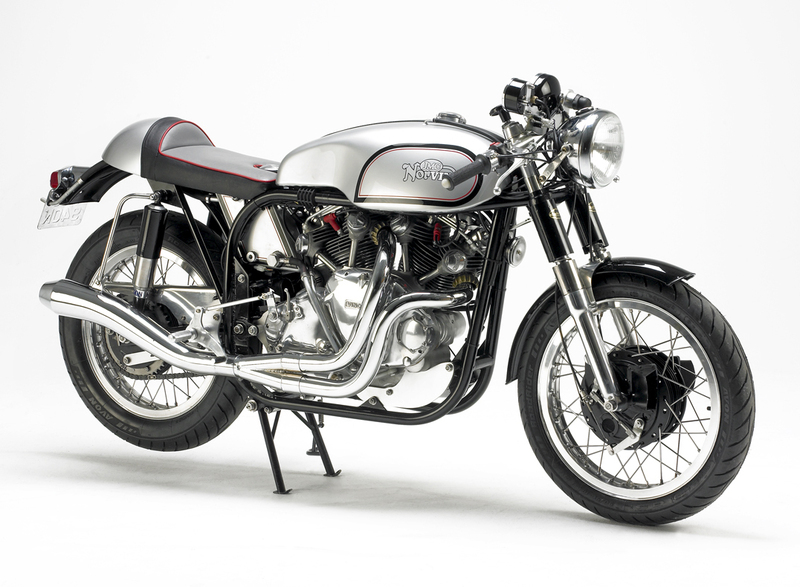 The bike was exhibited in the prestigious Museum Bilbao to represent ‘The Art of the Motorcycle’ display. 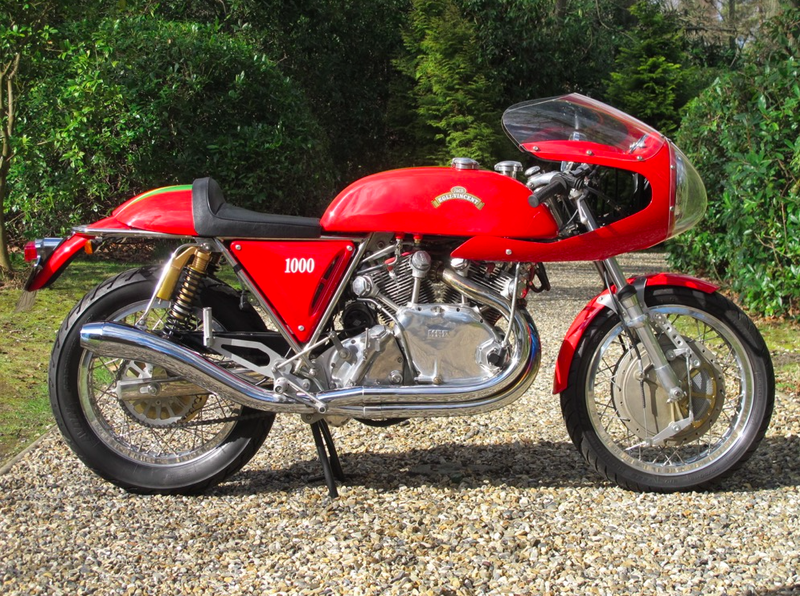 Later it was acquired by French enthusiast – hence the French number plates – who campaigned it regularly, notably at the Isle of Man TT. 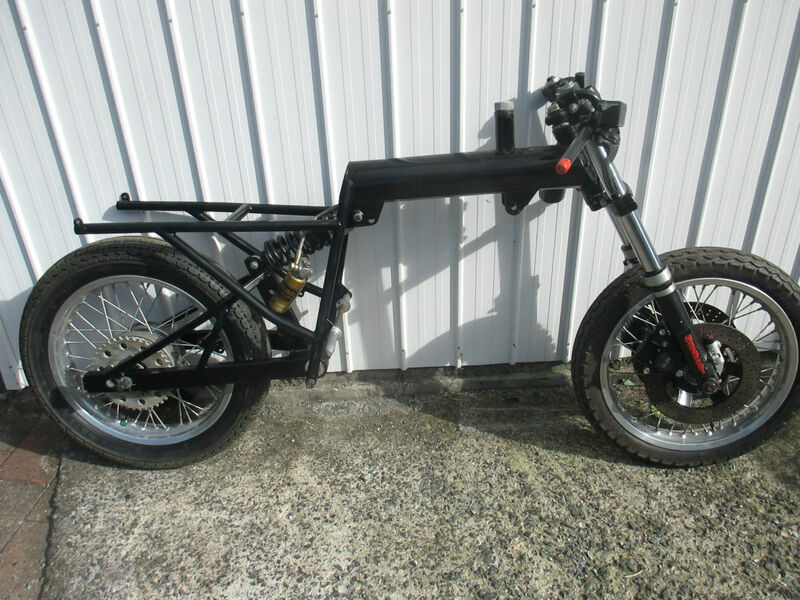 SOLD on eBay (New Zealand) on 4/17/17 |TPV (Terry Prince Vincent) rolling frame. For sale TPV rolling frame that includes (based on the photos as no description attached): the frame, cantilever swing arm, Ohlins mono shock, complete front fork, front and rear wheels, front Brembo brakes (no rear brake), clip-on and tank-seat in fiberglass. 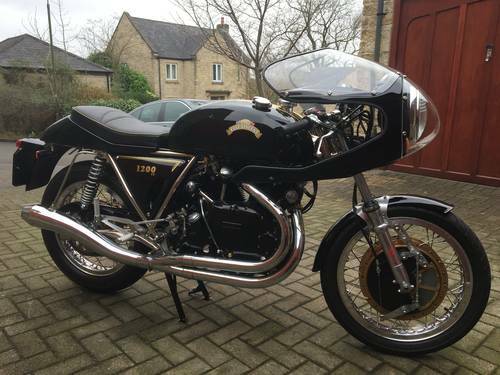 Comment: unlike what stated on eBay, this is not an Egli frame but a TPV (i), therefore it is not a 1966 year (said 1066) but 1990 – so be aware or titling challenges in some countries (ii) and last the Vincent single has a left hand side transmission so it may require mods on the swing arm to attach the rear brake, a point that needs to be checked with the vendor. Series B early engine (F10AB/1/271) and Wideline Norton frame. Comment: Neat assembly but asking price is over the market. Keep this in mind. 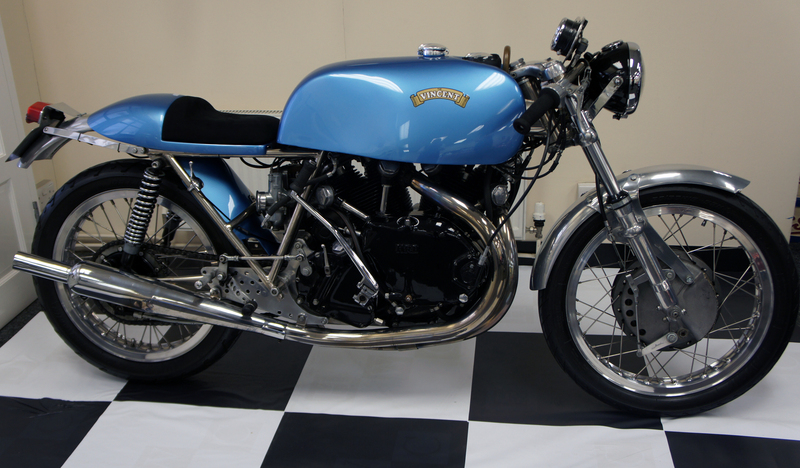 This Egli Vincent has been built by Conway Motors and has been ridden less than 500 miles. This special Rapide was made by Hartmut Weidelich. The engine has been optimized. The frame and the brakes have been modified. The oil tank is located in the frame. Offered for sale at 55.000 €. 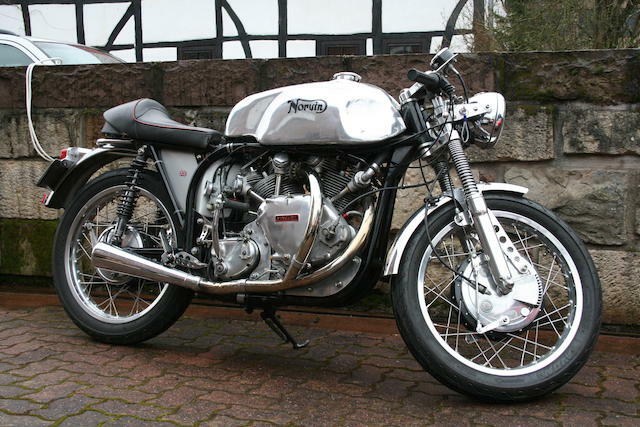 Built in 1969 in Switzerland by Fritz Egli motor Lightning Specification. 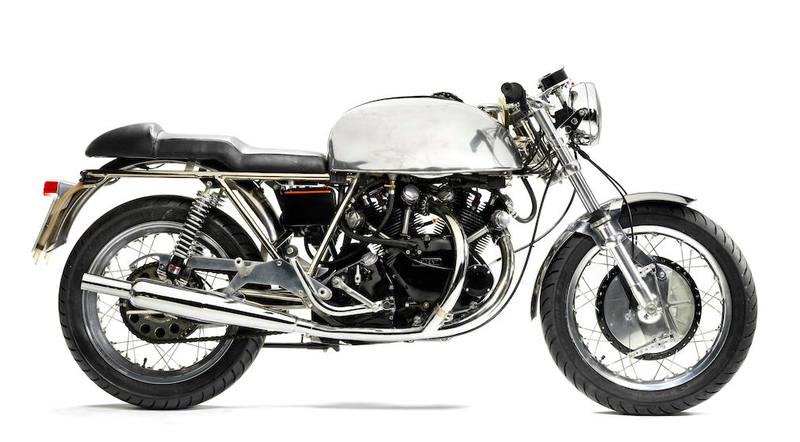 This was the first (and only) real bodied Egli-Vincent, who was taken to Sweden by the then importer, Håby-Sjoberg in Munkedal. This copy immediately became known to the whole Mc-Sweden because it was used as a drawing card including at Mc-Fair in Marble Halls 1970 in Håby-Sjoberg ads. Registered as a 1970 model. VIN number EV57D. The current owner since 2002 by Sivert Bomberg, is probably the country’s premier Vincent-renovators. Of the 1800 mile is visible, however, no trace, it is still in show condition. 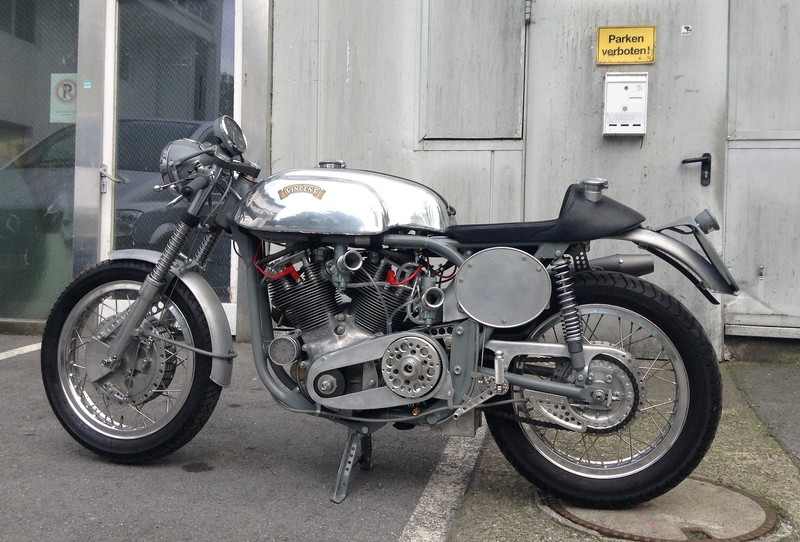 It is hoped that the unique bike to be able to stay in Sweden, so we hope for bid around 990.000 SEK ($110,000). Copious documentation included. Comment: a unique opportunity to buy the real thing. Comment: Not the most desirable JMC-NorVin with its open loop in front of the engine – On my opinion completely overpriced (£59,980). 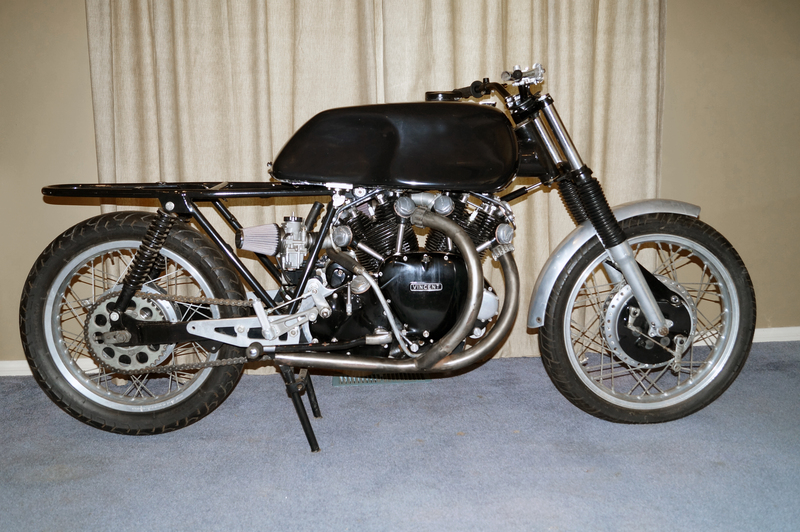 1952 black shadow engine in 1963 Norton wideline frame, buff log book, transferable reg built in 1963 by Ross Motors one owner from 1968 to 2011. 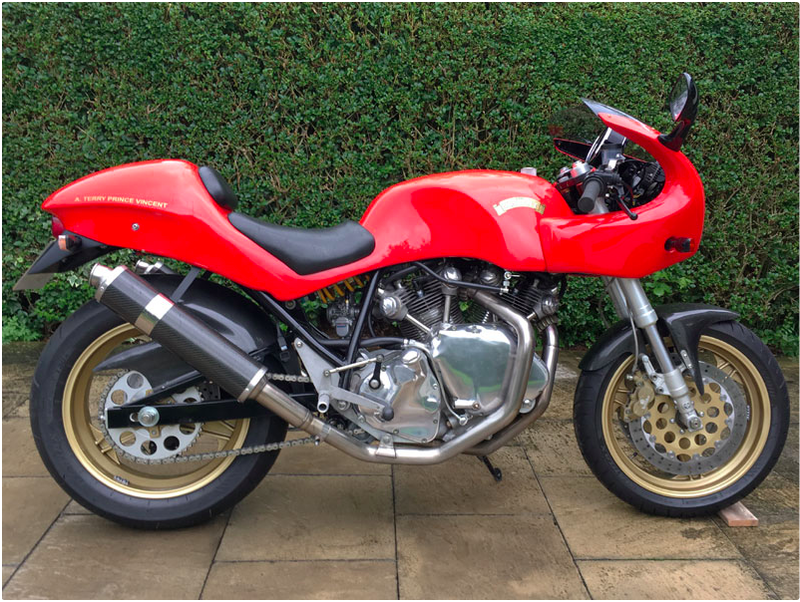 Bought as good running bike did cosmetic rebuild have done about 1000 miles, but noisey 2nd gear, BTH comp mag, no lug have been removed from engine will fit in to standard frame. Contact 07802 972 298 (ask Ken). Email may not be answered in timely manner for bidding. 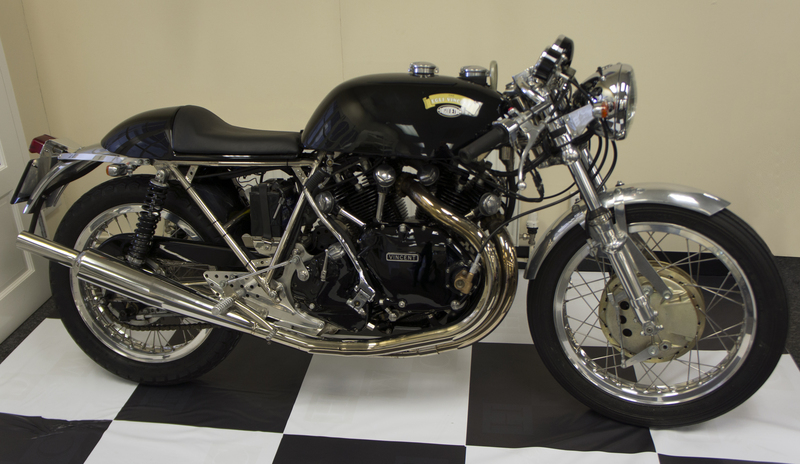 REMOVED – Egli-Vincent frame replica on 4/9/2016 in the UK. Comment: Unless you are a “pro” and motivated, you must know you are FAR AWAY to have a riding bike (hours and $) with such project. Think also that if the frame is not coded nor has its V2, that’s another upcoming hassle. 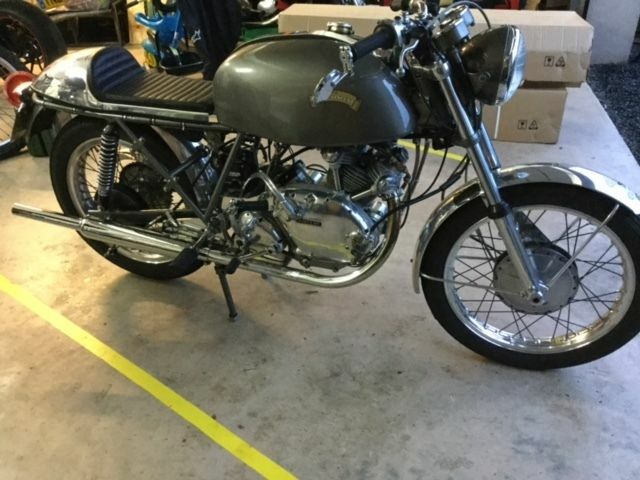 UNLISTED from eBay on 4/9/2016 in the UK | JMC-NorVin 1000. 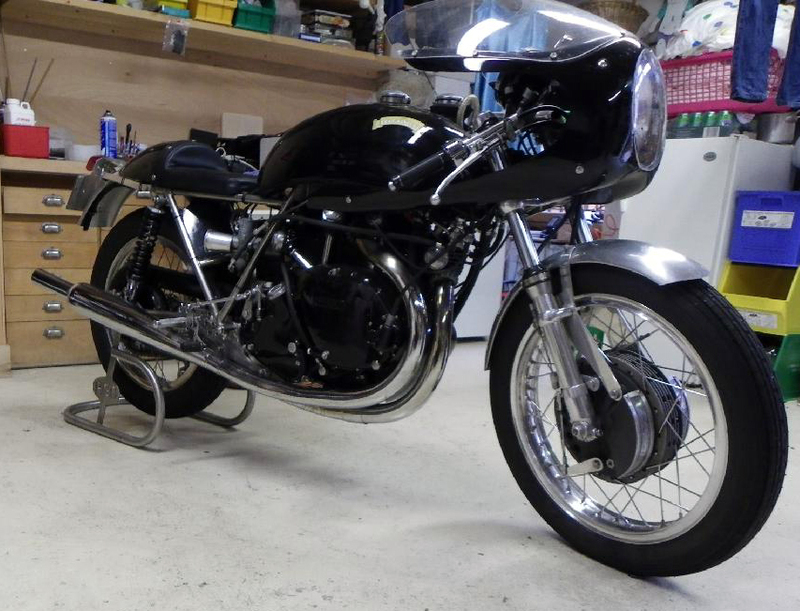 This is a Vincent Shadow 70 with a desirable Black Shadow engine (F10AB/1B/4868) and a Slater frame (VIN28). 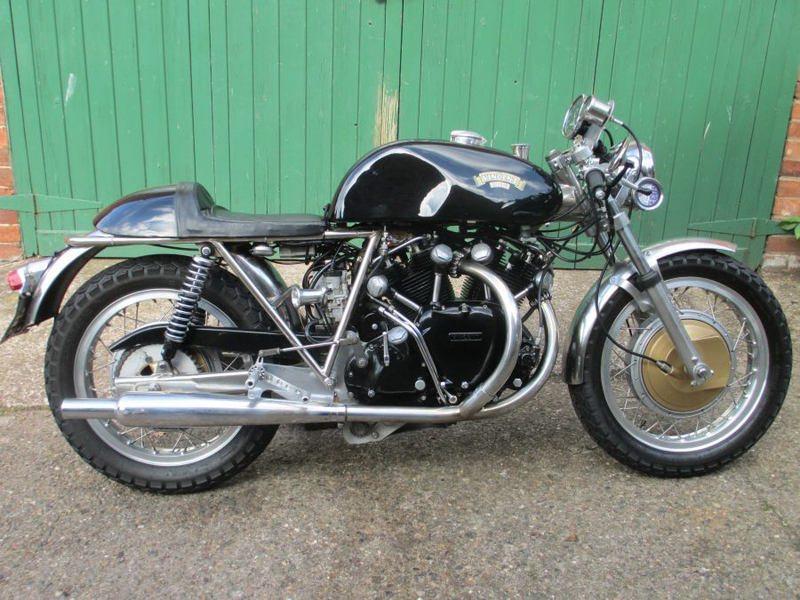 Sold for £34,500 ($50,052) Comment: a “bargain” with a Black Shadow engine. 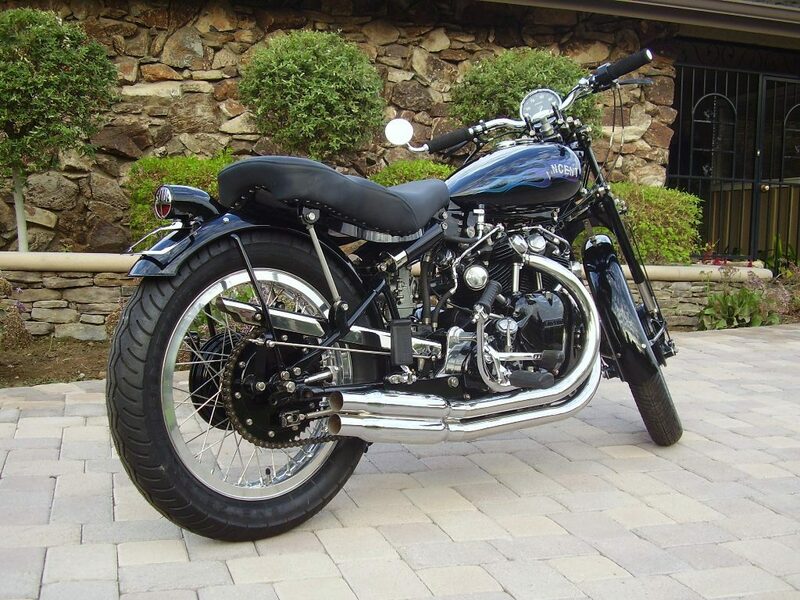 This 1954 Black Shadow engine in what may be a Cheney frame, says the description. Indeed, the rear foot pegs frame loops were not usually done by Cheney. 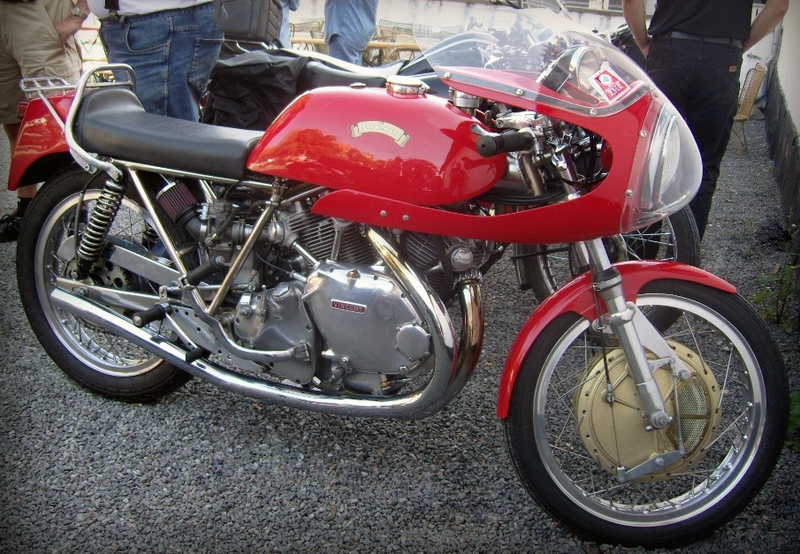 The Shadow 70 was assembled in the UK by Roger Slater from 1970 to 1972 after the Egli-Vincent license was terminated. Proposed on eBay this Shadow 70 built by Roger Slater in late 1970 or likely early 1971 based on the V.I.N. (VIN37) – not 1968 . 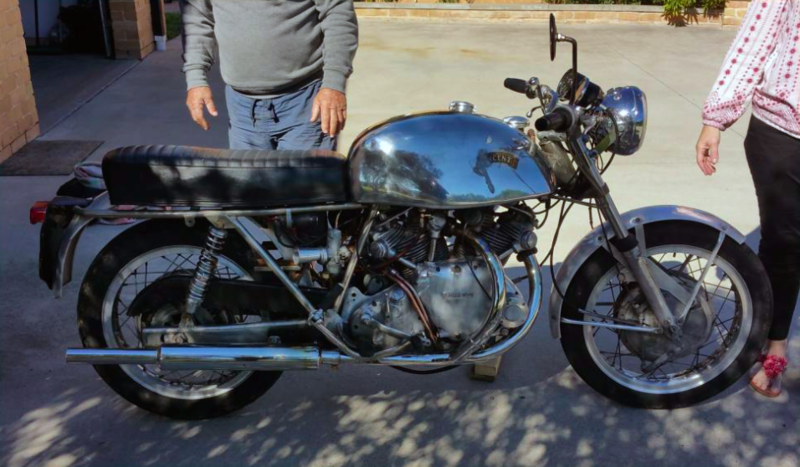 Note that the engine is an original Vincent that has been chopped and transmission (gearbox/primary) replaced by Norton element. Price is £35,000 as Buy it Now. 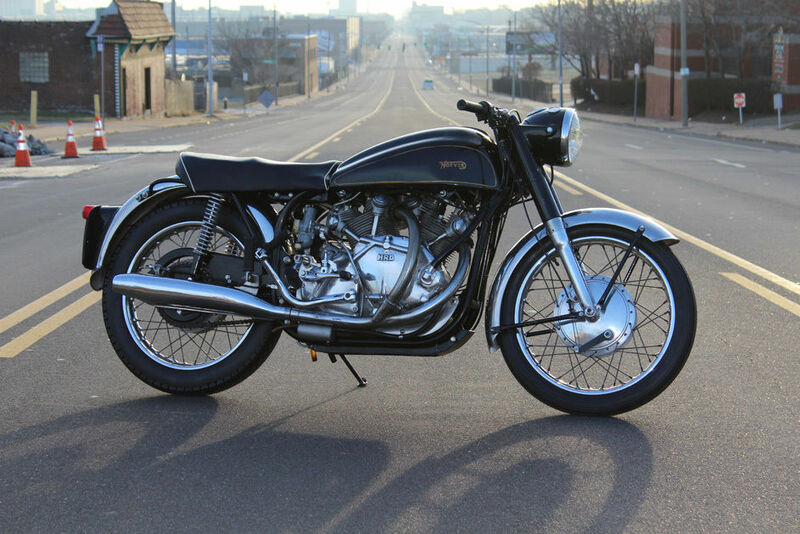 This bike is especially rare because it was built in the early sixties and registered as a ‘Vinton’ at that time. 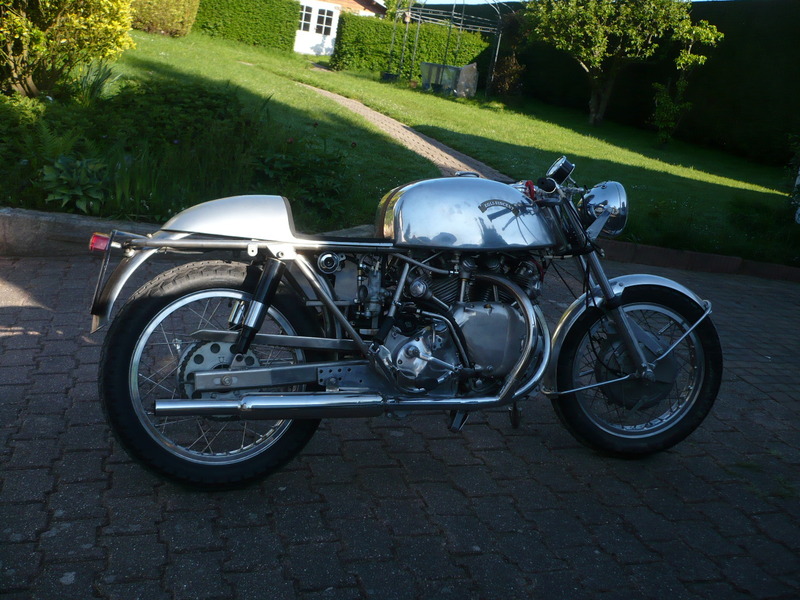 Chassis: Wideline Norton featherbed frame, Short Roadholder forks, Dunlop alloy rims on full width Norton hubs, Long circuit fibreglass petrol/oil tank, Manx seat, Clip-ons. 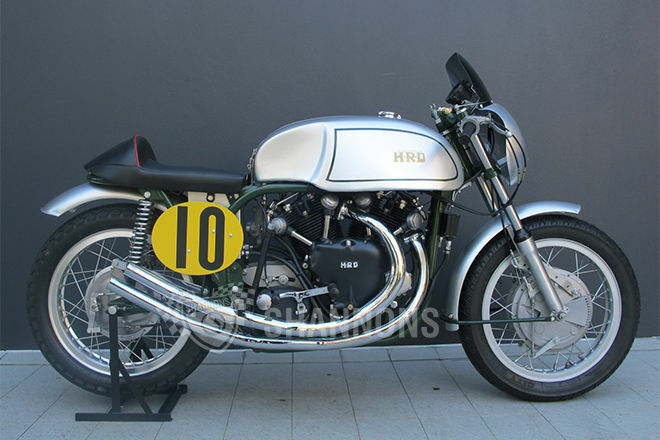 Features: Twin sparks heads, Lightning camshafts (Mk II), Omega pistons, Alpha Bearings crankshaft, Electric starter by Grosset, Alton alternator, Robinson 4LS front drum brake on Borrani rim, Black Shadow original rear drum brake on Dunlop rim, Chronométric Smiths clocks with km/h speedometer, All Tomaselli controls. 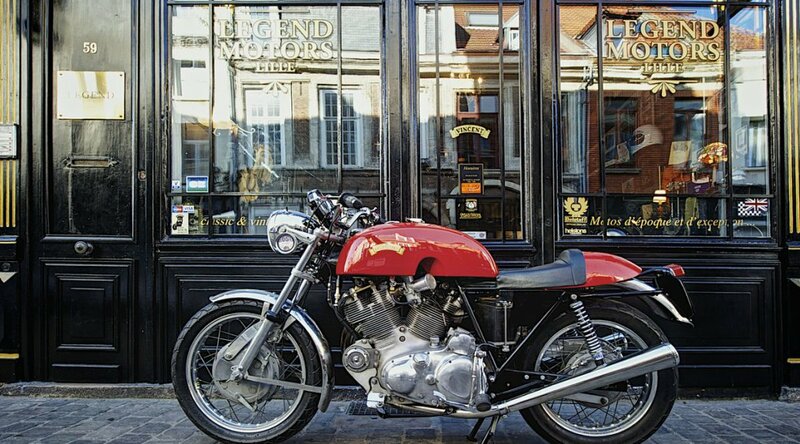 1968 Godet Egli-Vincent Café Racer shown here in Patrick Godet’s shop in France following completion in January 2012. This bike is 1,330cc and has the optional black engine cases, turn signals and battery compartment covers. 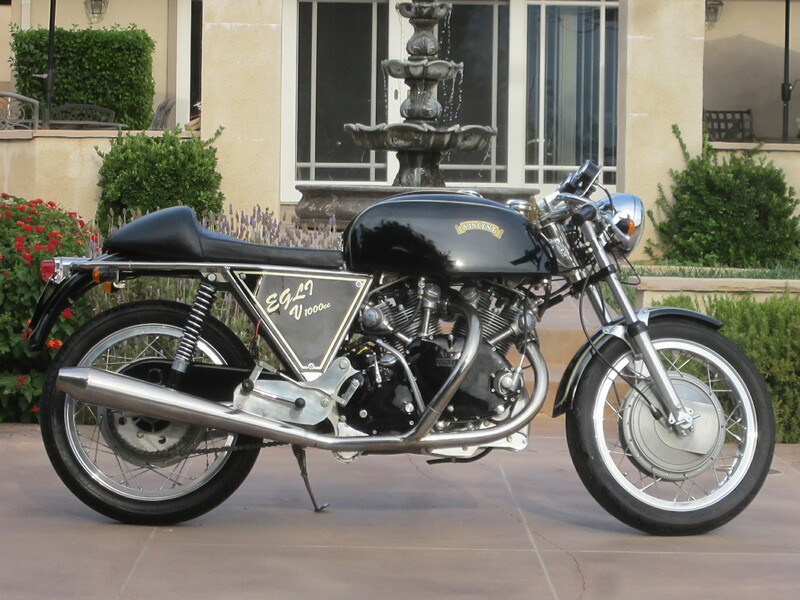 1968 Egli-Vincent (EV46) built by Slater in the UK. My comment: This bike is for sale for a while, price is definitely high. 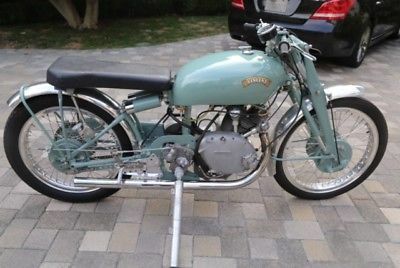 This Comet has been for sale for a while but did not sale Jun 1 on eBay at $20,100 (http://www.ebay.com/itm/131199200792).